Ze wskazanego przez użytkownika szablonu. Klikając dwukrotnie na plik *.dwt w Eksploratorze Windows. 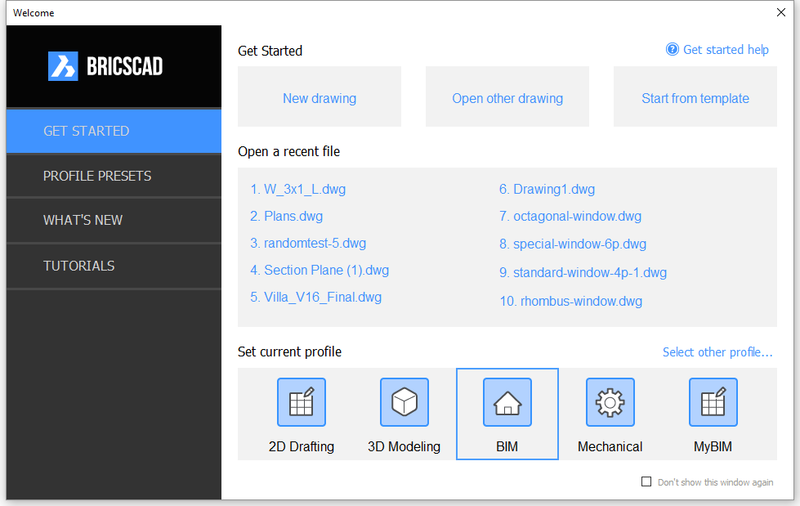 Select a profile in the Set current profile list, then click New Drawing to start BricsCAD with a new drawing using the default template of the selected profile. Select a profile in the Set current profile list, then click Start from template to start BricsCAD with a new drawing using a template, different from the current default template of the selected profile. The selected template becomes the default template of the selected profile. Units: Choose either Metric or Imperial. 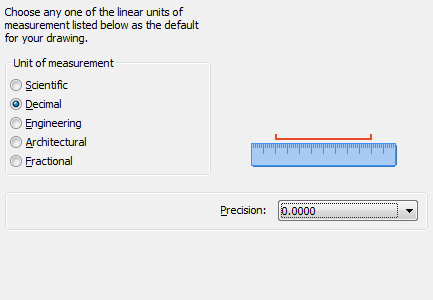 Your choice is saved to the MEASUREINIT (Measurement Initial) system variable. 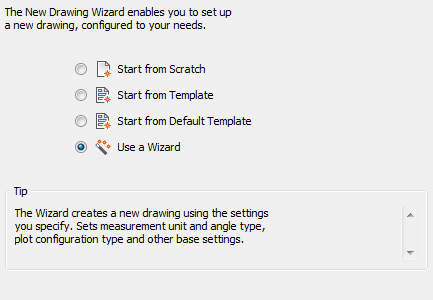 The selection of the workspace and the units type defines which template file is selected for the new drawing. Wybierz pomiędzy domyślnymi ustawieniami dla miar Calowych lub Metrycznych. Type newwiz in the command window, then press Enter. 2. Click the workspace you want BricsCAD to start in. BricsCAD is launched in the selected workspace, using the default template for this workspace. The drawing is created as a copy of the default template defined by the BASEFILE system variable. 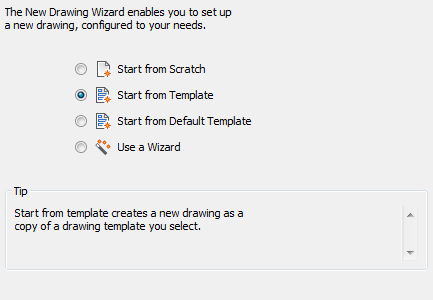 If the default template drawing is not specified, the Create New Drawing wizard is launched if the STARTUP system variable is ON, otherwise the Select Template dialog displays. Click the QNew tool button ( ) on the Standard toolbar. type qnew in the command bar, then press Enter. Nowy rysunek zostanie utworzony poprzez skopiowanie domyślnego szablonu. Wybierz polecenie Nowy kreator... w menu rozwijalnym Plik. Wpisz polecenie newwiz w pasek poleceń, wciśnij przycisk Enter. 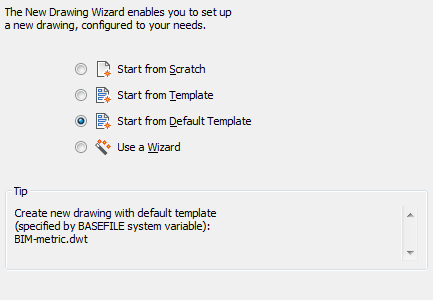 On the Choose a File dialog, select a drawing file (*.dwg) or drawing template (*.dwt), then click the Open button. W oknie dialogowym Utwórz nowy rysunek wybierz Rozpocznij z Domyślnego szablonu, następnie kliknij przycisk Dalej. Zostanie utworzony rysunek jako kopia domyślnego szablonu. 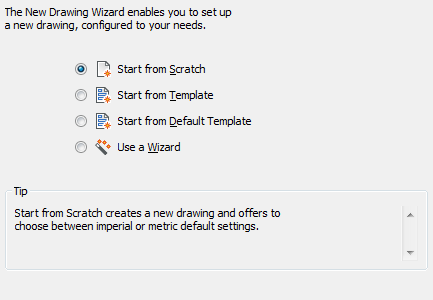 Choose New wizard... in the File menu. Click the Finish button to create the drawing. 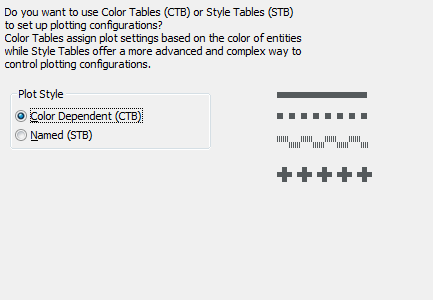 Using the above procedure it depends on the status of the BASEFILE and PSTYLEPOLICY variables whether CTB (Color table) or STB (Named plot style table) will be used to set up plotter configurations in the newly created drawing. Wybierz Nowy kreator... w menu Plik. Choose Associate an entity's plot style with its color for Color dependent plot styles. Choose No association between color and plot style for Named plot styles. Zostanie stworzony nowy plik jako kopia wskazanego szablonu. W oknie Utwórz nowy rysunek wybierz Stwórz od początku, kliknij przycisk Dalej. 3. W Opcjach programu / Drukuj i publikuj wybierz Polityka stylu wydruku (PSTYLEPOLICY). Wybierz Powiąż styl wydruku obiektu z jego kolorem dla tabel stylu zależnych od koloru. Zostanie otwarte okno Wyboru szablonu wyświetlając zawartość folderu Template jako ścieżka zdefiniowana przez zmiennąŚcieżka szablonu. W oknie Utwórz nowy rysunek wybierz Użyj szablonu, następnie kliknij przycisk Dalej. Wybierz Nowy... w menu rozwijalnym Plik. Wpisz nowy w pasek poleceń, wciśnij Entar. On the Browse for folder dialog, select a folder , then click the OK button. Wybierz plik szablonu, następnie kliknij przycisk Otwórz. Zostanie stworzony rysunek jako kopia wskazanego szablonu. 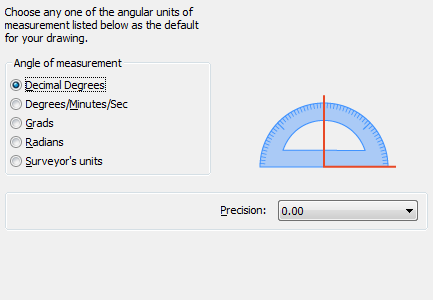 Select the Unit of measurement and the display Precision, then click the Next button. 5. Wskaż folder zawierający pliki szablonu, kliknij przycisk OK.
6. Select the default Color and Linetype. 7. Define the Grid, Snap, UCS icon and Marker Blips settings. 8. Click the Finish button to create the drawing. 9. (option) Choose Save As... in the File menu to save the drawing as a template in the Templates subfolder of the Local root folder.